← Alexis Sanchez: The Man on Fire!!! 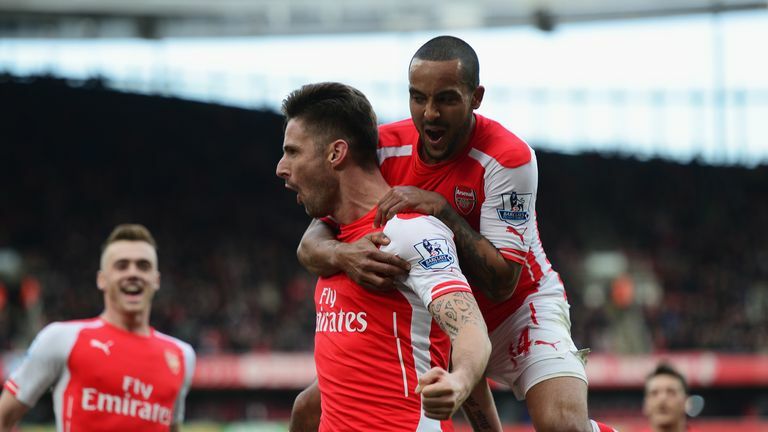 Can Giroud Cope With his New Status as Arsenal Backup Striker? Football can be a cruel sport sometimes. One moment you are the hottest thing on the planet. The next moment you’re a forgotten figure and folks would wonder if you ever existed. Look at the classic case of ex-Gunner, Thomas Vermaelen. The Belgian Verminator joined the club from Ajax and brought his aggressive and gung-ho style of defending to Arsenal’s back line, earning himself plaudits as the ‘Nemanja Vidic of Arsenal’. He even scored a couple of goals too and he was indispensable to the team. Things got even better for the Verm as he was named Arsenal captain after Robin van Persie’s acrimonious departure to Manchester United. Then things went downhill for the defender. Injuries and some erratic form saw the Belgian lose his place to Laurent Koscielny and he never found his way back into the team. After some more manhours on the bench, Vermaelen called time on his Arsenal career and made a swap to Barcelona’s bench that’s a bit warmer. If some sage or fortune teller had told the Verm that he would be on the bench a couple of seasons later after such an amazing debut season in England that saw him make 45 appearances and score eight goals, he must have thought that person was crazy, but hey, that’s football. Bringing my point back home, Arsenal has a certain Olivier Giroud that has suddenly found himself on the fringes at the club this season. From his time at Istres, Tours, Montpellier and his first three seasons at Arsenal, Giroud has always been the alpha-dog in attack. He’s an exceptionally fit player that has amassed so many minutes for his respective clubs with his first major injury layoff coming last season but he still managed to score 19 goals which was pretty impressive if you ask me. However, Giroud began this campaign quite poorly and Arsene Wenger offered Theo Walcott a chance in the position he really loves. Since Walcott got a run-out of games as a center forward he has been very impressive and his performance against Manchester United a fortnight ago would go down as one of his finest in Arsenal colors. Walcott continued his fine form on the international scene with a goal for England against Estonia and he’s odds on to start ahead of Giroud in the forthcoming games against Watford, Bayern Munich and Everton. Giroud may probably get the nod in the Capital One Cup clash with Sheffield Wednesday, and this essentially means that he’s now behind Walcott in the pecking order for the center forward position. “At Arsenal, I am in competition with Theo for the striker position, but he is doing well at the moment so there is no reason to change. “Whether it was at Tours, Montpellier or Arsenal, I have never experienced a situation like this, I have often played from the start. I need to take positives and to harden myself mentally. It is something new for me. I was in [Walcott’s] place in previous seasons at Arsenal. I imagine what he must have been thinking. But I feel that the coach believes in me. In eight Premier League games this season, Giroud has only started three games but he has done well to get three goals to his name. Wenger has stated that he’s going to rotate his team efficiently this season, so Giroud will get his chances. The question is, how has Giroud fared with the chances he has had this season? Since Walcott got the nod ahead of the Frenchman, he has made a lot of substitute appearances, and he has been afforded some great goalscoring opportunities he has spurned with the only exception coming in the 5-2 rout of Leicester where he put the icing on the cake for the Gunners. Giroud has to accept the fact that Walcott is in better form than him and Wenger would select a player in form. The competition is also healthy for the team and it would bring out the best in both forwards. Walcott has gotten how it feels to spend a lot of time on the bench as recently as last season, where the manager favored Aaron Ramsey and Alex Oxlade-Chamberlain ahead of the English speedster and it must have been hell. Then there was the protracted contract saga that made fans question his loyalty. After spending so much time on the bench, coupled with Giroud’s drought in front of goal, Walcott got a big break in the dead-rubber fixture against West Brom were he bagged himself a hat-trick and he also opened the scoring in the FA Cup final against Aston Villa, which gave his manager something to think about. Wenger had thought carefully about the potential of the forwards at his disposal and he opted not to sign a new striker in the summer – something that didn’t go down well with the fans. I’m happy to see both forward give their best to the team and what I love the most is the fact that Giroud and Walcott as two different types of strikers, which adds some dynamism to Arsenal’s play. With Giroud, the players pass to feet for linkup play and bombard crosses with the assurances that he would deliver and with Walcott, the players pass into space to exploit his frightening pace. These sorts of stuff keeps opposition defenders thinking. I hope both forwards can stay fit because they’re all we have at the moment. Danny Welbeck will be out for a long while. Posted on October 15, 2015, in Arsenal, Football, Premier League and tagged Arsenal, Football, Olivier Giroud, Premier League. Bookmark the permalink. Leave a comment.